Just for Kids Care Centers aim to provide quality educational programs for all children. Our programs are meaningful, multicultural and integrate additional needs in a warm, secure environment through qualified and competent staff. Kinderloop – Secure, Online Access to programs, photographs and individual portfolios. Kinderloop is a free service provided by Just for Kids which allows you to receive daily programs, photographs, observations and centre information through a secure Online app. This will be your child's individual portfolio that you can access through the app at anytime. Once we have your permission form, you will be sent a link via email to set up your own free Kinderloop account that only you will have the password to. Include as many emails addresses as you like! 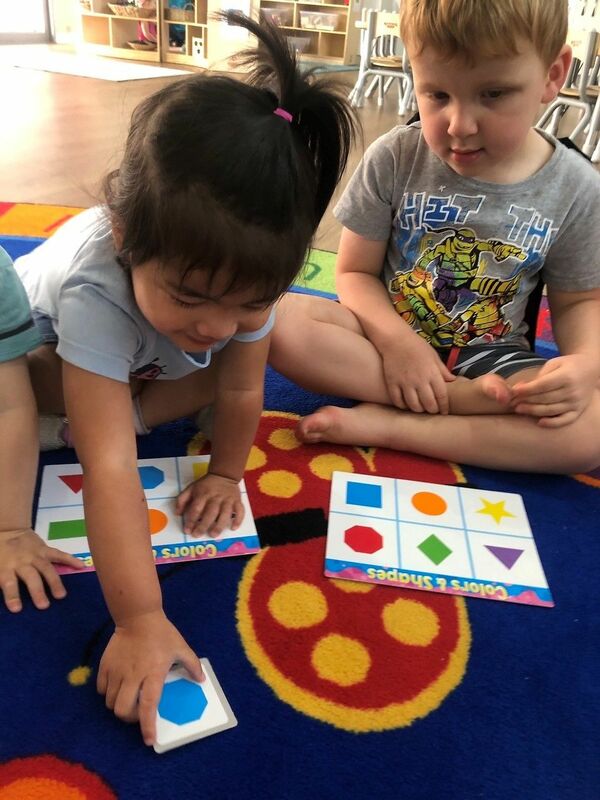 With the use of ELLA resources children learn language other than English through an interactive play-based curriculum with the use of technology and one on one interactions with educators. Fit and Funky Kids Classes are available for children to join at each of our centres. This is a fitness program is fun, stimulating and enjoyable for the children should you wish to enroll. Each week Miss Paula delivers a new program that promotes the exploration and development of important Fundamental Movement Skills through various experiences such as dance, yoga, sport and drama. Each year Just for Kids provides exciting and educational incursions for children of all ages. These include visits from our wider community such as: Fire Brigade ,Police, Dentist, Nurses, Doctors, Paramedics, Happy, Healthy Harold and many more. We also host an Annual Christmas Party, and provide experiences such as Hatch and Grow, Kindifarm visits and much more! Our program is based on The Early Years Learning Framework. This is a National Curriculum which all centres in Australia must follow. Within the program we aim to cover all developmental areas. Our Team of Highly Qualified Educators work together to create and implement Educational Programs that are stimulating and enjoyable for children of all ages. We follow the Early Years Learning Framework to ensure we meet the elements required by the NSW Department of Education. This enable us to link and work hand in hand with families and the wider community to ensure your child is delivered the necessary program, experiences and resources to meet all of their developmental milestones and needs whilst in our care. At Just for Kids we believe that Childcare is a stepping stone for children to develop their curiosity and understanding of their world. Our aim is to prepare children for formal schooling by providing them with opportunities and experiences to better comprehend their world and to learn more about themselves. We will strive to work hand in hand with you to prepare your child for their transition to their formal schooling years, by offering them a head start in life and in learning. At Just for Kids we aim to provide an environment where your child can learn in a variety of ways that are exciting and provoke natural exploration and curiosity, which in turn will allow them to flourish and develop to their fullest potential and beyond. We strongly believe that supporting children's school readiness is about assisting children in all areas of their development, throughout each aspect of the daily routine. This includes self-help skills, independence, social skills, listening skills, communication skills, and concentration as well as pre-writing skills, literacy and numeracy- just to name a few. We recognize that all children are unique and develop at their own pace, therefore we treat each and every child as an individual and with respect whilst supporting their growth and development. We believe it is imperative that children develop these skills and many more before commencing formal schooling, as these skills lay the foundations for their future success. We continue to work closely with NSW HEALTH and implement a Munch and Move program within each of our centres. Our Educators have training in Munch and Move and are provided with resources to ensure that physical activity, good health and nutrution are promoted within our centres. Our menu has been developed, approved and certified by NSW Health Munch and Move program ensuring the children are eating healthy nutritious meals and snacks which meets their individual dietary requirements. The programs are designed to provide opportunities for children to learn about good nutrition, the importance of regular physical activity and taking care of themselves. We understand that babies routines can vary from time to time, therefore we adapt our daily routines to meet the individual needs of each child in our Jellybabies rooms. We have a primary educator from the Jellybabies room available at all times for families to share information daily that may affect their normal routines. By being flexible with our routines, we ensure that the children feel safe, secure and all their needs are met. For more information on any of our programs or to visit one our centres please contact us or view our gallery.